Once your daughter is married and their lives start to build, you just sort of expect the grandchildren will come at some point. But when infertility hits, hearts start to break. My “mommy heart” broke for my girl as she struggled with not being able to have children. I cried a lot of tears for her and for us thinking we’d never be blessed with grands. Dear friends of theirs introduced them to a wonderful Christian Adoption organization here in Texas that handles open adoptions. The birth family is given bios of adoptive families and they are able to choose who their child goes to. A lot of thoughts and emotions go into this process, even from the grandparents. You’re just not sure how this will all work. What will be the dynamic between the families of this child? Or more importantly, what shouldn’t we say? I can only guess as to the emotions for the extended birth family. I think acceptance has to be the key. Accepting that your child needs to give up their child in order for that baby to have a good life. I hope our circumstance is more of the status quo in an open adoption. We have developed a relationship with the birth family. Not that we’re close friends, but visits happen often throughout the year and we have a common bond of love for these children. The boundaries are just understood. The interesting thing is that the birth mom got pregnant again and gave birth to another child thirteen months later. Both those babies became a part of our family. My daughter and hubby were able to take each baby home after 48 hours, so they were “our” kids from the get-go. There was no mistaking that our love ran deep for these babies. I knew a dear woman in Colorado that had adopted three kids but also had three of her own. She always told me that there was absolutely no difference in her love for all of them. Whether adopted or not, they were her children. I always admired that in her because when you’re not in that situation, you just don’t know how it would feel. I can now wholeheartedly agree, it doesn’t matter if you adopt them or if you give birth. As a grandmother, there is no way I could feel that they are not my grandchildren. They are children in need of love. They are blessings from God that have come into our lives, maybe a bit different than what one feels is the normal way, but to me, this felt perfectly normal. Once you see them at their new home and care for them, love them, anticipate how they will grow up, they are yours. We flew to Texas from Colorado shortly after our grandson was born. We knew in our hearts that this child was our grandson. It was love at first sight. It didn’t matter how he got here, he was now a part of our life. When our granddaughter was born by the same birth mom and birth dad, I was able to be with them. I took care of my grandson so that my daughter and hubby could be ready to go see their new daughter when she arrived in this world. It was an exciting time for everyone as we awaited the arrival. The birth family were all in attendance. We sort of expected it to be awkward, but it doesn’t have to be. When all are in agreement that this is best, it works. It may not be an easy thing, but sometimes it is a necessary thing. And I can tell you first hand, it is about the best gift one can receive, second only to the salvation that Jesus brings. I have so much thankfulness in my heart for this family and the gift they gave our family. We knew we couldn’t continue to live so far away and plans were made to move nine hundred miles to be a part of their lives. And God continued to bless us after my daughter had multiple surgeries, she conceived and gave birth to a son. Just as God adopted us into His family through His Son Jesus Christ, we were able to be blessed by the adoption of these children. Like my friend, I echo, there is no difference in the love I have for these three grandchildren. My heart is full and I am abundantly blessed. 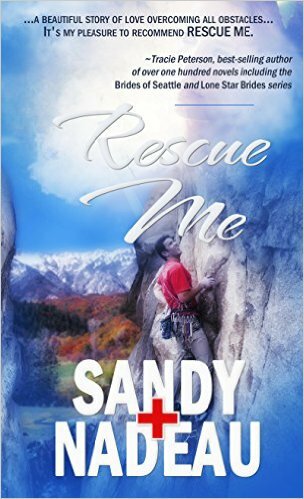 Sandy Nadeau loves adventures and loves to write about them. She has two books out that share Colorado adventures in story. After thirty years there, a writing background and a love to share about Jesus, she now resides in Texas to be close to her three grands! Happy is she! First Responder Ronnie Spencer has a no-dating-firefighters rule. She lost her father to a fire, and won't risk the heartbreak of losing someone else. But when Steve McNeal returns, Ronnie’s heart is tested. How can she swear off dating a firefighter when she has to work with the one man she used to love? When the unthinkable happens, Ronnie has doubts. How can a loving God allow tragedy to stalk her life again? As her faith wavers, Ronnie must decide. Will their blossoming relationship be quickly extinguished by the very thing she feared, or will Ronnie trust God and allow her heart to be rescued--even if that means giving it to a firefighter?